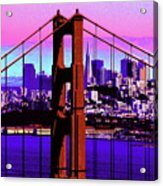 Digital Sunset - Ggb by Lou Ford - 10.000" x 6.625"
Digital Sunset - Ggb framed print by Lou Ford. Bring your print to life with hundreds of different frame and mat combinations. Our framed prints are assembled, packaged, and shipped by our expert framing staff and delivered "ready to hang" with pre-attached hanging wire, mounting hooks, and nails. I worked on the Golden Gate a number of times. Pretty cool photo, Lou. 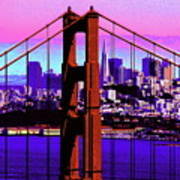 Digitally altered photograph, giving a sunset look, of the north tower of the Golden Gate Bridge with San Francisco in the background.